The Montessori system of education is both a philosophy of child growth and a rationale for guiding this growth. It is based on the work of Dr. Maria Montessori (1870-1952), world famous educator and psychologist. It is built on the child's need for freedom within limits. The classroom environment is prepared in such a way that the child moves naturally through a progression of materials which satisfy her/his emotional, physical, intellectual, and social needs. Children naturally have a deep love and need for purposeful work. A Montessori environment like ours plants the impression early on that learning is not a passive experience. Our students are invested in the process. Children should be respected as different from adults and as individuals who differ from each other. The unconscious learning which takes place from birth to age 3 is gradually brought to a conscious level by age 6. Early experience in the hands-on environment of a Montessori classroom prepares the brain for future learning. When a child is in an environment where choices can be made, it empowers them. This builds their security and confidence and develops the mindset "I can handle my world." "An adult works to perfect the environment. A child works to perfect himself." "The child learns everything without knowing he is learning it, treading always in the path of joy." "The most important period of life is not the age of university studies but the period from birth to the age of six, for that is the time when intelligence itself is being formed." Ruthe is the school administrator and classroom directress. She is certified by the American Montessori Society (AMS) for Primary Education and has a Bachelor's Degree in Child Psychology. She has taught in Montessori schools since 1974. All of the staff members at Maple Park have been with the school for many, many years. They are committed to the Montessori school philosophy and are dedicated to creating a caring and positive environment for the children in our school. 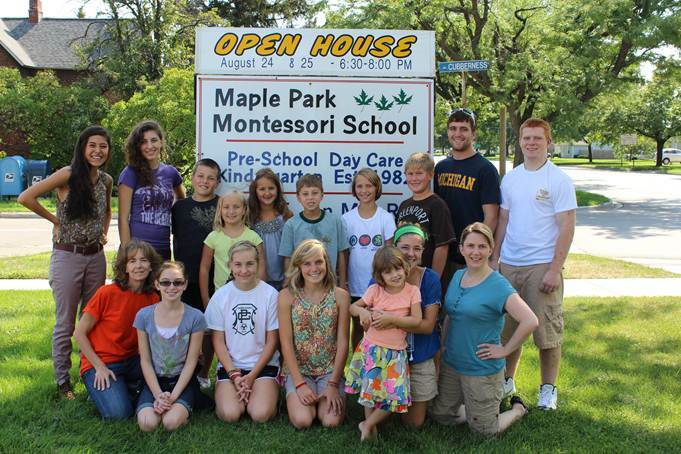 Maple Park Montessori is a non-profit Montessori school with primary and kindergarten classes and a full daycare program. It is licensed by the state of Michigan, accredited by the Michigan Montessori Society and follows the guidelines set up by the American Montessori Society. Children can begin at age 2 years 9 months and continue until they are ready to make the transition to a first grade classroom. The 3-6 year old child is intensely interested in learning about the facts of the world and the guidelines for social behavior within that world. A child at this age possesses unusual sensitivity and the mental capacity for absorbing and learning from the environment. He or she is said to have an absorbent mind, ready to soak up whatever the environment has to offer. The areas of the primary curriculum include practical life, sensorial, math, language, geography, biology, art, and music. The extended day session is for children of kindergarten age and is a continuation of their primary experience. At about age 5, the Montessori child emerges as a leader and role model for younger children and enters the 9:00-3:00 extended day program. Knowledge acquired in the previous years at Maple Park becomes evident as the child begins to read, write words and sentences, and work out math problems. We offer a sensitive and caring environment for children who stay beyond the Montessori session. Some children spend as many waking hours at school as at home, and our program provides structured playtime as a continuation of the classroom experience. Maple Park also offers a fun-filled summer program. This includes work in the Montessori classroom in the morning, as well as special art, craft, science, and cooking activities. Field trips and special activities are planned. Children may participate in the 9-week summer program on a full or part-time basis. In addition, several week-long enrichment workshops are offered throughout the summer. Why does a Montessori program meet five days a week? The Montessori experience is for five consecutive days in order to allow the spontaneous learning, both academic and social, of the child to flow smoothly. A child taken in and out of school every other day does not have an opportunity to pursue her/his unfolding interests. The consistency and predictability of a Montessori environment Monday through Friday reinforce the life skills that children need to be independent, motivated learners. This is equally true for three-year olds as it is for five-year olds. Why is there a mixed age group of children in each classroom? Having a three-year age span is important for two reasons. First, it allows for the differences in the skills, interests, and concentration spans of children. These do not always follow a strict age criteria. Secondly, a mixed age group makes it possible for younger children to see the challenging academic work that lies ahead of them. Children are extremely proud of their accomplishments and then have opportunities to help others once they have mastered a skill. This excitement for learning and helping develops a positive attitude in their Maple Park years and beyond. Why choose Montessori extended day instead of kindergarten? The work that the extended day students do is a continuation of the math, science, geography, phonics, and writing foundations that have been developed in the previous two years. There is no restarting or relearning in a new way; the children just add (in depth and breadth) to what they are already so excited about. A traditional kindergarten program will usually take every student back to the beginning and then move every child along at exactly the same pace. Special bonds develop among the children in extended day. They work at solving problems, planning activities, and caring for the younger children and the school environment. They are filled with goodwill toward each other, and their self-esteem soars. This combination of amazing academic growth, social skill development, and positive self-worth makes the extended day year irreplaceable. It lays the foundation for attitudes about learning and problem solving that will stay with the students through elementary, middle, high school, and college. How do Montessori students adjust to a traditional elementary school setting? Children who have been in a Montessori program are generally very flexible and adjust quite easily to a traditional school setting. They are almost always better prepared academically and are self-directed, with a positive attitude toward learning. The school provides many opportunities for families to join together for fun activities and to celebrate student accomplishments. In addition, Maple Park students connect to the community outside their school throughout the year. "I chose Maple Park Montessori through a recommendation from a life long friend. I didn't know anything about Montessori philosophy but knew when I walked into the school that this was where my kids would go." "I think my daughter's first day of (full-day) kindergarten at Maple Park sums it up -- after being at school from 9 until 3, she came home and played school for three more hours! She is happy and comfortable there (which to me says great things about the staff). She is learning and enjoying it (which to me says great things about Montessori)." "What sets Maple Park apart from other schools is definitely the staff. It truly feels more like a family than a school. Kids are treated with all the love and care you want for your young child, but their growing sense of autonomy and independence is really encouraged. Our son left Ms. Ruthe after three years with a genuine love of learning. He was more than ready for 1st grade, both academically and socially. When he entered 1st grade he already had great reading, writing, and math skills. Even more important, he knew how to make good decisions in the classroom and on the playground. He was also very comfortable working with others or alone." "We chose Maple Park Montessori because after we looked at several pre-schools, we just couldn't imagine our son anywhere else. We loved that when we walked in, it was calm, yet children were busy with activities. Another thing that caught our attention was how they would really seem to be concentrating and would stay with a project until they were done. The more we looked into it, we saw that the children were truly having fun accomplishing such big-people tasks and loved being there." "We chose Maple Park Montessori because we felt that it was the only preschool we visited that would make school a consistent and enjoyable routine for our daughter. We were also impressed by her first reaction to the classroom environment and her comfort level with Ruthe. It made it much easier to let her go on the first day of school knowing that she would be happy to be there." We encourage all interested parents to observe a class in session. This is an excellent way to gain a first-hand impression of the purposeful work, positive social interaction, and peaceful atmosphere that is unique to our Montessori environment. Visits for parents and their children can be scheduled for any late afternoon during the school year. Current tuition rates are available by calling the school between 7 a.m. and 6 p.m.